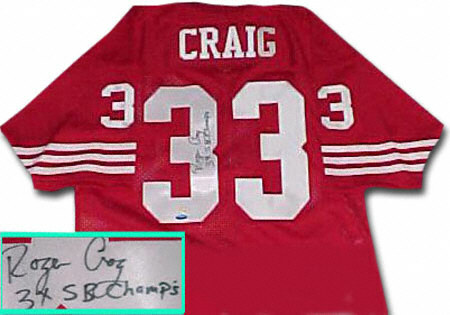 He might not have the same high-profile nature like some of his teammates, but Roger Craig cards and autographed memorabilia have been popular for a long time. 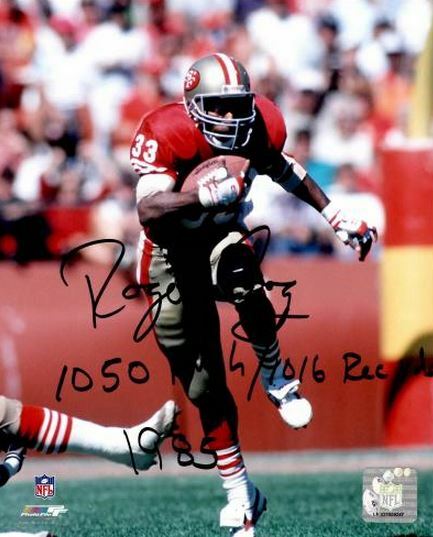 As a staple in the San Francisco 49ers backfield, he was an instrumental part of the team's dynasty in the 1980s. Craig played in the postseason every year of his career. During those ten years, Craig won three Super Bowls, was a four-time Pro Bowl Selection and was named to the 1980's All-Decade Team. Combine those professional accomplishments with being a standout for a football-crazed school like the University of Nebraska and you have a highly respected and collectible player. 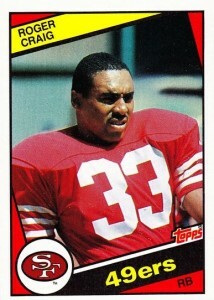 The Roger Craig rookie card is part of the 1984 Topps Football set. He also had a card issued by the San Francisco Police Department that was included in the 49ers team set. Roger Craig's first certified autographed cards were issued in 1991 Pro Line Portraits. One of his most popular autographed cards is part of 1997 Upper Deck Legends. His first game-used memorabilia cards were manufactured in 2005 by Donruss/Playoff. They were included in Gridiron Gear, Throwback Threads, Leaf Certified and Leaf Rookies and Stars. Roger Craig's autographed memorabilia has maintained its value through the years. 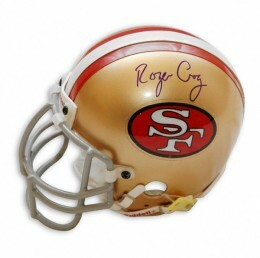 The large fan base of the San Francisco 49ers has kept his signature in demand. Craig does participate in autograph signing events. This has helped ensure a healthy balance between supply and demand. It's easy to overlook Craig's rookie card. He shares the spotlight with a Hall of Fame roster that includes John Elway, Dan Marino, Eric Dickerson and Howie Long. The design of the 1984 set was a hit with collectors upon its release. It is also one of the most collectible football sets of the 1980s. Below you will find an example of what Roger Craig's authentic signature looks like. This can be used as a first point of reference for determining the legitimacy of autograph memorabilia, but is not a substitute for having your items authenticated by a well-respected professional autograph authentication company. Some of the trusted sources within the sports memorabilia market include the following companies: PSA, JSA, Tristar, and Mounted Memories. Click on any of the images below to view full size photos. Unlike most athletes, the first letter of the signature is the one that most often varies. The "R" is sometimes written with its open looped shape as shown above. Other times it takes on more of a printed look. The "g" is distinguished by the tear-dropped shape loop. The "C" starts with a small straight line before beginning its curve. The "r" is visible with an up stroke that slightly flattens at the top before beginning the down stroke. The "a" is visible and usually has a small opening. The "i" is sometimes dotted, other times not. The "g" is written similarly to how it is in the first name.